wondering how you will ever make it through? Just stop looking at the depth of the water. Put your eyes on the one who walks with you. Step out in faith and follow Jesus, he’ll lead the whole way through. Just as he’s done for others, he'll make a way for you. God said he would make a way. But God didn’t part the waters until they took a step of faith. Just step out in faith and follow Jesus, he’s waiting there for you. but you’ve chosen to go another way. Now you’re walking down a path filled with heartache. Jesus waits by the riverside today. but God doesn't part the water until you take that step of faith. Step into the water, he’ll make a way for you. In a message during a spring revival, Pastor Rick Drummond asked the question, “Why did they wait on the banks of the Jordan?” He was referring to the account in Joshua 3:1 where the children of Israel came to Jordan, and lodged there three days before passing over. I’m not sure why they waited three days, but Pastor Drummond made an interesting application with the story. He said that if you stand too long on the banks of what God wants you to do, you will never cross over because sin enters in. It’s not the size of the Jordan that’s important, it’s who you’re trusting. The Jordan will always be there, even if you close your eyes. God opened up the Red Sea, and he can get you over Jordan, but the water won’t part until you put your feet into the water. The first time we plunge into that water is when we get saved. But as we make our way along this journey there are so many other times that Jesus calls us to the water's edge, and says, “Just take the first step and I’ll part the water for you.” But how many times does our pride or our fear keep us from stepping out in faith to do something that the Lord has put before us? How often do we just camp out for a while until we spot a trail going off in another direction, and convince ourselves that this is the way God really meant for us to go? Sometimes God has to bring us back to that riverbank many times before we are willing to surrender our will, and step out in faith and follow him. I'm constantly amazed at how many times I've written a song or a devotion, only to find out, months or even years down the road, that it was written for me. 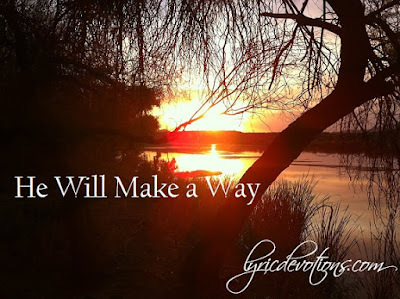 I had no idea when I wrote "He Will Make A Way," that three years later it would speak to me! I suddenly realized that I'd been pacing up and down that river bank, waiting for the Lord to show up in a boat, put a life jacket on me and paddle me across to the other side! But that's not the way it works, and I knew that. So, I finally took the plunge...I didn't put my toe in to check the temperature, I didn't look to see if there were any sharp rocks, and I left my stack of life jackets on the shore! Was it easy? No. Had I made the right decision? Yes! The water was wonderful! For the rest of this story, you'll have to read my book! Joshua 3:1, 13 And Joshua rose early in the morning; and they removed from Shittim, and came to Jordan, he and all the children of Israel, and lodged there before they passed over. And it shall come to pass, as soon as the soles of the feet of the priests that bear the ark of the Lord, the Lord of all the earth, shall rest in the waters of Jordan, that the waters of Jordan shall be cut off from the waters that come down from above; and they shall stand upon an heap.